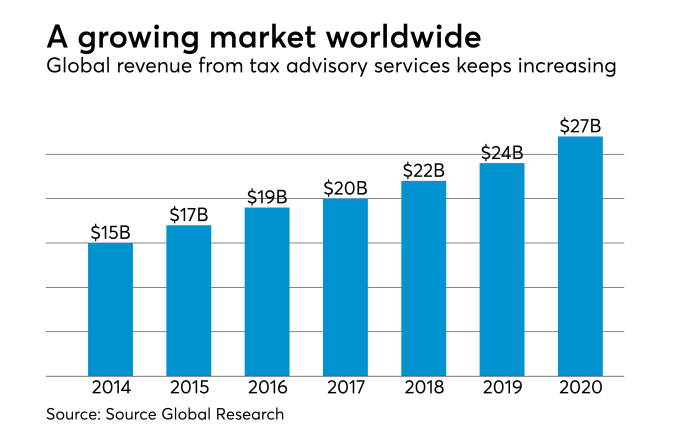 Tax advisory revenue at professional services firms expanded 8.6 percent to $20.3 billion in 2017, and grew by around $5 billion in just the three years from 2014 to 2017, according to a new report. The report, from Source Global Research, found that the main tax advisory services around the world are business tax management (estimated to total $9.27 billion globally), transfer pricing (totaling $5.18 billion), and international tax (amounting to $1.58 billion). The financial services sector is the largest sector asking for global tax work ($6.64 billion), making up almost a third of the world’s tax advisory market in 2017. The total market is estimated to grow to $24 billion this year and $27 billion next year. The report found that the firms controlling the biggest share of the global tax advisory market were the Big Four, with an 87 percent market share. Ernst & Young led the pack with a 35 percent share of global revenues. The London-based research firm saw the U.K. tax advisory market expanding at a slightly slower rate of 7 percent to $2.2 billion in 2017, but it predicted that once the details of the U.K.’s exit from the European Union becomes clearer this year, growth in the tax advisory market is estimated to nearly double to 13 percent from Brexit-related work. The report forecasts that the U.K. share of tax advisory revenue will grow more quickly than any other European country next year.